One thing to be said for self-awareness is that, with luck and a bit of effort, you’ll like what you see. Being good to others, kind to others, and loving towards others starts with being good, kind and loving to yourself. 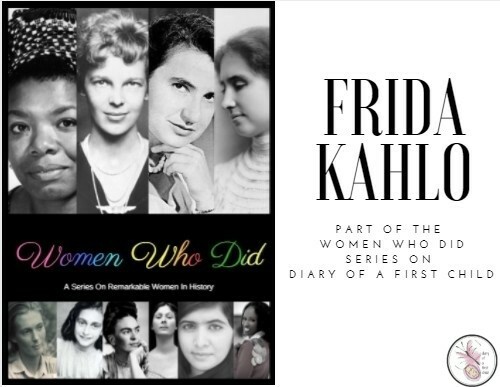 Frida Kahlo spent a lot of time on her own after the accident that should by rights probably have killed her or left her paralysed. 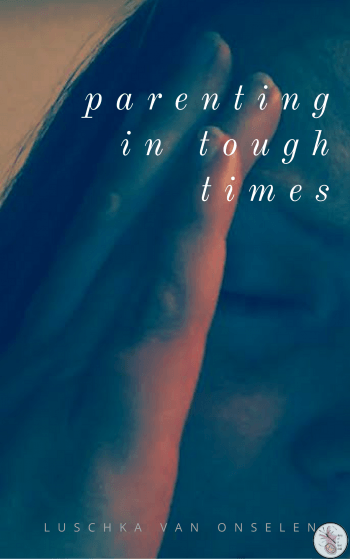 She spent the rest of her life in a lot of pain, and as a result, a lot of it alone. 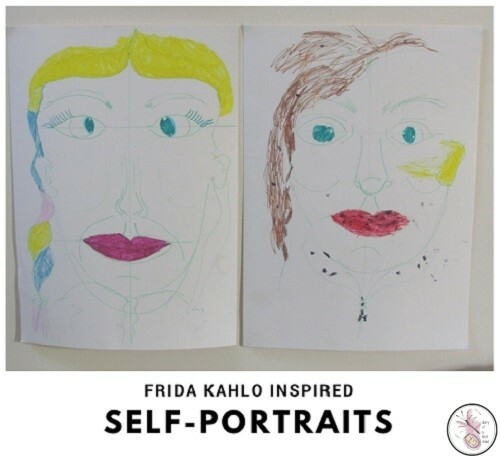 Frida Kahlo painted over 50 self-portraits in her life, many of them depicting her “message of pain” (read more about the stories behind her self portraits at ArtyFactory – it’s not all happy reading so I’d recommend a pre-read). 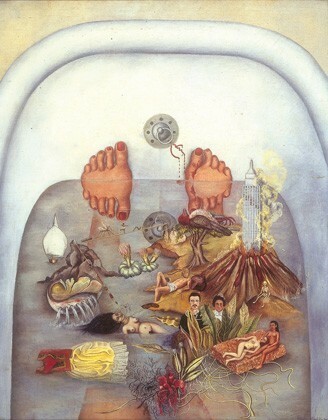 Some of the portraits were about her, rather than of her – for example What the Water Gave Me is a picture of her legs and feet in the bath, surrounded by lots of other floating images. Donna, knowing that we’re learning about Frida Kahlo and surrealism (which Frida didn’t believe she was, because “I never painted dreams. I painted my own reality.” 2 turned up with the 3 activities for the kids to do. For some reason the kids weren’t keen on looking in the mirror, so Donna drew outlines of faces for them, and they painted/coloured them. Between you and me, you wouldn’t be able to identify the kids on the street using these as self-portraits but that’s not the end of the world. They did the activity and are quite happy with the results. 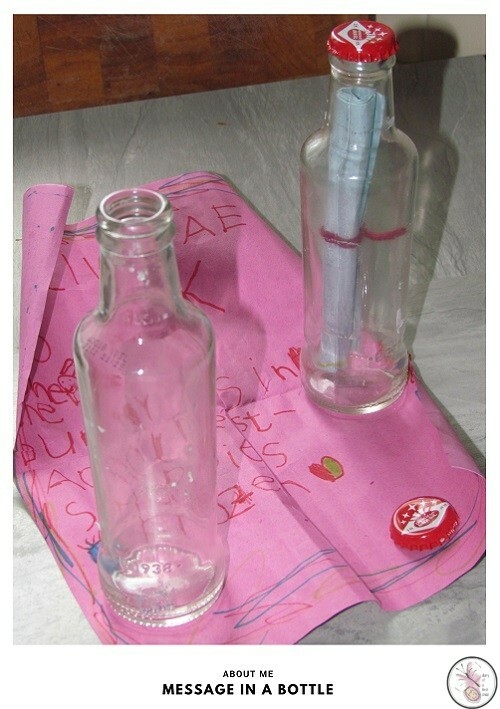 Donna has a whole art project around poems in bottles which have been sent all over the world to be buried and ‘found’ at some point in the future. She brought some bottles for the girls, and got them to write about themselves: who am I, how old am I, what’s my favourite colour, my best friend and so on. I thought that’s a really good activity for self-reflection. It’s like a time capsule you can look back on later in life. What a sweet and simple idea. You can bury it somewhere, if you like, (I’m not so keen on throwing it in the ocean these days!) and add a phone number or email address, to see if anyone ever unearths it! Ours is going into the memory box where the girls can look back on it one day. 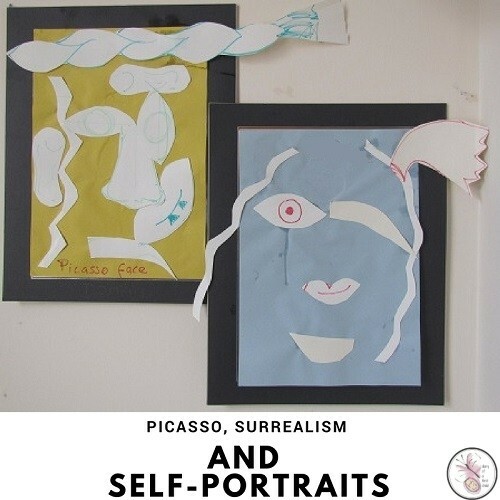 Not strictly Frida, but still a self-portrait and still surrealist, Donna cut out parts of faces and had the kids arrange theirs into Picasso-esque self-portraits. Interestingly, during all this self-portraiting, the kids were talking to Donna about bullying and what to do when you’re being bullied and so on. I thought it was an interesting lead-in, reflecting on self, and diverting to external opinion. These final two activities weren’t with Donna, but I’m adding them here as they fall under the ‘self-portrait’ and ‘about me’ category of activities. We don’t have a lot of magazines that are good for cutting up, but I had the kids go through the ones we have and choose images that resonated with them – that said something about who they are. They chose things from the two magazines I could find, and then I printed a bunch of pictures from Google and let them choose which ones they felt were relevant to them. 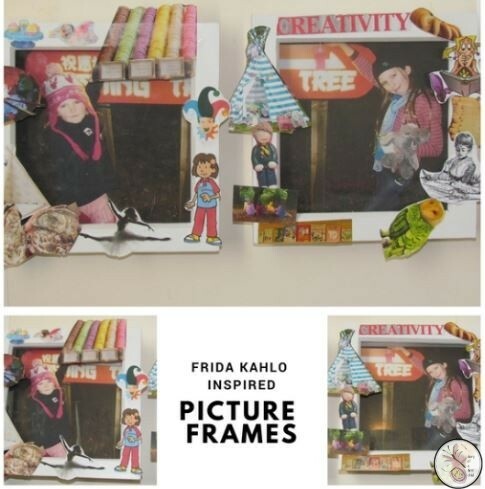 We used square deep box frames from The Range and I printed one of our recent photos (for each frame) then the girls used regular Bostik White Glu to stick the pictures to the wooden frames. This activity requires a conversation about feelings and healthy ways to express them. It’s one of those nice activities where you can work and talk at the same time. 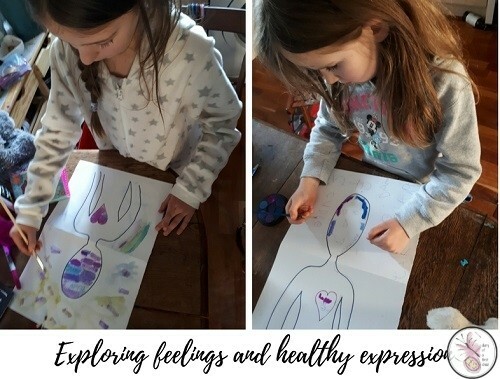 The book suggests starting with the body outlines already drawn, and then using a marker pen to write the feelings we feel in the head and heart spaces. Around the body write down ideas on how we can express our feelings in healthy ways. It’s a fantastic talking activity to do with children. 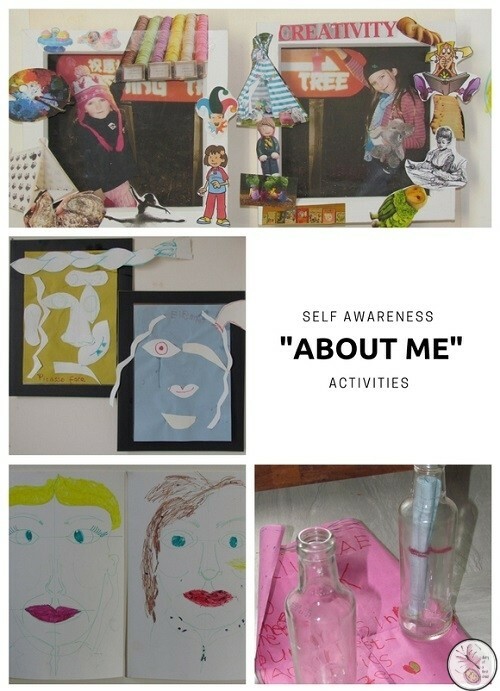 There’s a lot of power in being self-aware, so giving kids the tools to know who they are is a valuable life skill. A lot of Frida’s “self” was portrayed in her flamboyant and bold dress sense. We’ve made headbands, jewellery and beads to compliment this theme.